Wyoming Game Warden, Joe Pickett, finds his relatively new father-in-law tied to the blade of a windmill dead as a door nail. Joe’s beloved (sic) mother-in-law, Missy, has been arrested for his murder and Joe sets out on his own to dig up the facts. Not necessarily to prove her innocence, but, rather to dig up the facts. Nate’s hiding place is discovered and a shocking death ensues. Nate goes on a hunt to find those responsible. 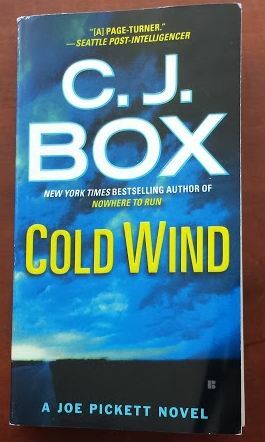 With the political issues behind the Government’s push for renewable energy sources as the backdrop (in this case wind power), “Cold Wind” is a wonderfully complex story of love, hate, and deceit. More deaths follow…Martin would indeed be proud.